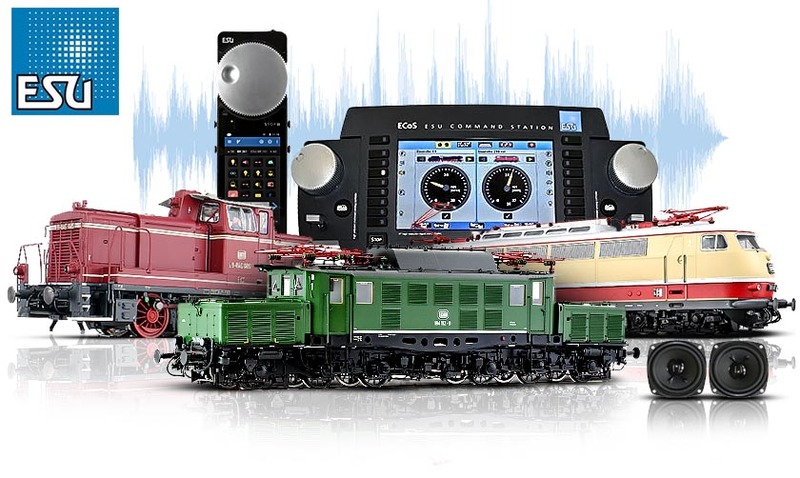 ESU Model Trains - "Digital command control with original sound"
ESU is the leader in high-quality Model Trains, decoders, digital systems and accessories.Â They are the producer of LokSound decoders, Ecos DCC systems, and accessories. The most important development for ESU was the revolutionary LokSound family of decoders. ESU is however much more than an electronics company they also construct some of the best HO locomotives on the market today.Â Their HO models are all metal and packed with innovations which are not offered by any other manufactures.Â Their locomotives are also dual system models they can run on both DC and AC layouts.Â Recently ESU launched the Pullman brand.Â Pullman offers passenger and freight cars in HO and locomotives and cars in both G and 1 gauge. ESU is a full line model train manufactures and their assortment is growing every year.Â To watch some of their amazing models in action view our YouTube page, we have made several nice videos showcasing their incredible locomotives.